After last year, when the United Kingdom voted to leave the European Union and the United States elected Donald Trump as president, xenophobic nationalism was beginning to seem irresistible. Yet France has now become the biggest power to buck the trend, electing as its president the socially liberal, pro-immigration, and pro-Europe Emmanuel Macron. 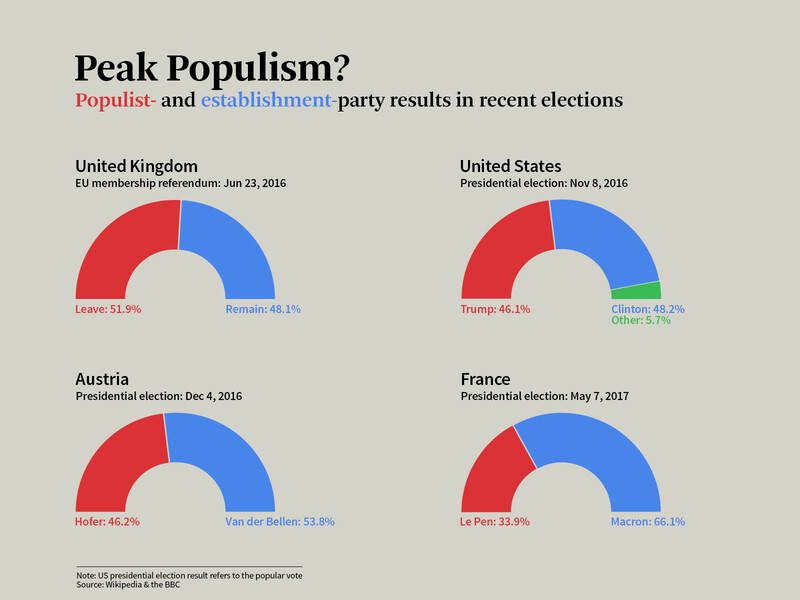 Has the wave of right-wing populism in the West really crested, as some are claiming? Macron’s remarkable victory certainly merits celebration. An independent centrist standing in his first election, Macron saw off the established parties’ candidates in the first round two weeks ago and won nearly two-thirds of the vote in the runoff against the far-right National Front’s Marine Le Pen. As the only leading candidate to take a firm line against Russian President Vladimir Putin, he faced a last-minute leak of hacked (and fake) emails and other attempts to smear him. Macron achieved all of this by offering a message of hope to an angry and depressed country. He presented himself as a dynamic outsider capable of bringing change to a gridlocked political system. His youth – he is just 39 years old – reinforces the image of renewal. As with Canadian Prime Minister Justin Trudeau, good looks and easy charm also help. But fulfilling the promise of change will not be easy. Like Britain and the US, France remains deeply divided between those who favor a liberal, open society and those who seek closed politics and borders, between supporters of European and global integration and proponents of nationalism and protectionism. Macron’s large margin of victory over Le Pen is misleading, as it obscures French society’s enduring fragmentation and polarization. In the first round, only half of the electorate voted for broadly pro-EU candidates, while the other half backed candidates, from either the far left or the far right, who loathe the EU in its current form. Though Macron came out on top, he secured only 24% of the vote – just three percentage points more than Le Pen and the lowest leading share since Jacques Chirac in 2002. Like Chirac – who faced Le Pen’s father, Jean-Marie, in the second round in 2002 – Macron won the runoff by a landslide not because he swept French voters off their feet, but because many could not bring themselves to vote for the National Front. And though Le Pen did worse than expected, her 34% share in the second round was nearly double that of her father in 2002. In France’s semi-presidential system, Macron can deliver the change he promised only with a supportive majority in the National Assembly. Yet it is far from certain that French voters will give him one in next month’s legislative elections: one recent poll suggested that 61% don’t want Macron to have a majority. Some projections do have En Marche ! , the political movement that Macron founded a year ago and that will contest the elections under a new name, La Republique En Marche ! , emerging as the biggest parliamentary group, but suggest that it will fall short of a majority. Some anticipate that the Republicans, who feel entitled to govern after five years of unpopular Socialist rule, will come out on top. They may even win a majority, forcing Macron to appoint a conservative prime minister and government. Macron’s prospects also depend on how many disenchanted (or opportunistic) Socialist and Republican politicians choose En Marche ! , not to mention Macron’s ability to cut deals with parties and candidates. If no candidate in a constituency wins a first-round majority, the top two, plus any candidate who obtained more than 12.5% of the vote, go through to the runoff. Electoral pacts are thus vital to secure the withdrawal and support of less popular candidates who might draw votes away from En Marche ! candidates, half of whom will be newcomers to politics. And gaining a working majority is only the first step. If he succeeds, Macron will need to deliver the political and economic shake-up that he has promised, in a country that has resisted reform for decades. Most French voters are sick of a political class that feathers its own nest while neglecting their concerns. Macron wants to make the political system more open and accountable, with financing of political parties becoming more transparent. He wants to bar politicians from hiring their relatives, accumulating paid positions, and amassing over-generous pensions. And he wants to cut the number of parliamentarians by a third. On the economic front, Macron must lubricate arthritic markets and lighten the tax and regulatory burden on risk-takers, while helping people to cope with disruptive trends like globalization and automation. Above all, he needs to reduce unemployment, particularly among young people, nearly a quarter of whom are out of work. All of this will require Macron to overcome entrenched vested interests. Even ordinary citizens, despite largely recognizing that the system is dysfunctional, often resist change, for fear of losing whatever they do have. But perhaps the biggest challenge facing Macron will be to persuade Germany’s next chancellor, to be elected in September, to work with him to reform the eurozone. A more flexible, growth-friendly approach will require Germany to address its vast current-account surplus of 8.6% of GDP. Here, pressure from Trump may, for once, be helpful. Macron also wants to build a more integrated, effective, and democratic eurozone, with its own budget, finance minister, and parliament. If Germany is serious about making the single currency work, it should engage constructively with Macron. If it doesn’t – or if Macron fails to reform France – liberal democracy might end up even worse off. Like Macron, Matteo Renzi was 39 when he became Italy’s prime minister in 2014 on a promise to shake things up. But Renzi failed to change much, soon became unpopular, and resigned after losing a referendum last December, leaving anti-euro populists well placed to win the next election. Let’s hope Macron does much better.